Nexus 5X (codenamed bullhead) is an Android smartphone manufactured by LG Electronics, co-developed with and marketed by Google as part of its Nexus line of flagship devices. Unveiled on September 29, 2015, it is a successor to the Nexus 5. The phone, along with the Nexus 6P, served as launch devices for Android 6.0 Marshmallow, which introduced a refreshed interface, performance improvements, increased Google Now integration, and other new features. The phone was widely praised by reviewers on release, although many devices later began experiencing spontaneous unrecoverable bootloops. On October 4, 2016, Google presented its successor, the Google Pixel; the same day, the Nexus 5X was discontinued and removed from the Google Store. The device has a fingerprint sensor on the back called 'Nexus Imprint' which can be used by third party apps. The phone is compatible with Project Fi, Google's own mobile network. In order to save power, Google has introduced what it calls an 'Android Sensor Hub'. It is a secondary low-power processor whose purpose is to run activity-recognition algorithms by directly monitoring the device's accelerometer, gyroscope, fingerprint reader, and camera sensors, allowing the main CPU to remain inactive until something requires its attention. The Sensor Hub recognizes when the device has been picked up and will automatically display notifications in a low-power white-on-black text until the screen has been properly activated. Additionally, the Sensor Hub stack also supports hardware sensor batching, a feature introduced in KitKat that permits sensors to delay for a short period of time the handoff of non-critical data to the operating system – as opposed to sending a constant stream of data to the CPU, which results in the use of more power. Sensor batching has been used in step counters to avoid requiring the main processor to constantly remain awake for each step to be measured. The Nexus 5X houses a 12.3 megapixel (1.55 μm pixels) f/2.0 aperture Sony IMX377EQH5 rear camera which is assisted by laser autofocus and dual LED flash. It can record 4K UHD videos at 30 FPS and slow motion videos at 120 FPS. It also has a 5 megapixel Omnivision OV5693 front camera. Although the rear camera hardware is the same as the Nexus 6P, the Nexus 5X lacks a burst mode and slow-mo video is limited to 120fps at 720p resolution. The Nexus 5X and 6P were among the first phones to use a USB-C connector instead of the hitherto standard Micro-USB connector. However, despite the Type-C connector, the USB port will only transfer data at USB 2.0 speeds (480 Mbit/s), and not USB 3.0 speeds (5.0 Gbit/s). Also, video is not available on this port, so Type-C-to-HDMI adapters will not work. However, USB On-The-Go is supported. Google and LG also made USB Type-C 'Rapid Charging' compatible with the device, claiming up to 4 hours of use in 10 minutes. iFixIt has assessed the Nexus 5X as easy to repair, the only issues being the lack of removable battery and a display fused with the front glass. The phone originally came with Android 6.0 Marshmallow, which includes "Now On Tap", "Doze" battery saving feature, detailed control of app permissions, and support for Google "Imprint" fingerprint sensor. In December 2015, Google released Android 6.0.1 Marshmallow for the Nexus 5X, among other devices. On August 22, 2016, Google released Android 7.0 Nougat for the Nexus 5X, as well as several other devices. Google released Android 7.1.1 Nougat for the Nexus 5X (among other devices) in December 2016. Among other changes, this update brought some features to the Nexus 5X that had been previously exclusive to the Pixel and Pixel XL phones. On August 21, 2017, Google released Android 8.0 Oreo for the Nexus 5X. Android 8.1 Oreo was released for the Nexus 5X, as well as some other devices, on December 5, 2017.. The device received its last security patch in December 2018. Color choices include Carbon, Quartz, and Ice. The body is a hard polymer plastic with the proximity sensor, light sensor, voice speaker on top of display and audio speaker below display, RGB LED notification light under audio speaker, and front facing camera on front of device. The back of the device includes a 12.3 megapixel camera, Google "Imprint" finger print sensor, dual tone flash, and LGE's laser auto focus. One side of the device contains the nano-SIM slot and the other includes the power button, and volume buttons. Microphones are on top and bottom of device. Ars Technica termed the Nexus 5X and Nexus 6P as "the true flagships of the Android ecosystem" and noted the "few to no compromises"; with further praise for the 6P for being only slightly more expensive than the 5X while having a more premium metal body and higher specs. The Verge criticized the Nexus 5X's specifications as its "Snapdragon 808 processor and 2GB of RAM aren’t up to pace with the most powerful phones in 2015", implying that it would not age as well as the more powerful Nexus 6P. Some Nexus 5Xs in early batches had yellow-tinted screens, which Google replaced. Some users have reported that the display has touch-sensitivity problems when the charger is connected. Many users have reported spontaneous unrecoverable bootloops. The issue seems more prominent following the update to Android 7.0, but users on Android 6.0 have also reported being affected. No clear pattern among affected units has emerged and no statement identifying affected units has been made by LG. However, it has been identified as a hardware issue. ^ "Nexus 5X H791F Android smartphone". LG Electronics. Retrieved January 21, 2019. ^ Langshaw, Mark. "Google's Nexus 5X smartphone has an official release date". Digital Spy. Retrieved October 13, 2015. ^ a b Pandey, Rajesh (October 4, 2016). "Google Unveils Pixel and Pixel XL with Snapdragon 821 Chipset, Android 7.1 Nougat, and Google Assistant". Android Beat. Retrieved April 18, 2018. ^ Zimmerman, Steven (October 12, 2016). "Sony IMX378: Comprehensive Breakdown of the Google Pixel's Sensor and its Features". XDA Developers. Retrieved October 17, 2016. ^ Chester, Brandon (November 9, 2015). "The Google Nexus 5X Review". AnandTech. Retrieved April 3, 2017. ^ Hall, Chris (September 29, 2015). "Nexus 5X official: What's the story so far?". Pocket-lint. Retrieved September 29, 2015. ^ Davenport, Corbin (October 4, 2016). "Nexus 5X and 6P removed from Google Store, NVIDIA Shield and VR headsets gone too". Android Police. Retrieved April 18, 2018. ^ "Hands-on with Google's new Nexus 6P smartphone". The Verge. Retrieved September 29, 2015. ^ "Nexus 5X and Nexus 6P will be available on Project Fi". Android Central. ^ "Google's Android Sensor Hub knows how your Nexus is moving". Engadget. Retrieved September 29, 2015. ^ "The New Android Sensor Hub Will Significantly Improve Idle Battery Life While Doing More With Sensor Data". Android Police. Retrieved September 29, 2015. 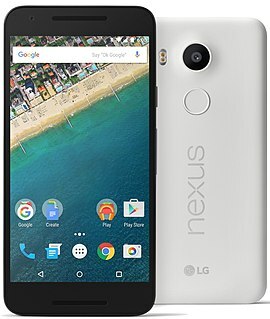 ^ "Nexus 5X hands-on: a look at Google's new affordable phone". Android Authority. Retrieved October 16, 2015. ^ "Google Nexus 5X Pros And Cons". Tech Gadget 360. Retrieved October 26, 2015. ^ "Google's Nexus didn't just pull an Apple with USB-C". SlashGear. October 2, 2015. Retrieved July 3, 2016. ^ "LG Nexus 5X is quite easy to repair according to iFixit". GSMArena.com. ^ "Android – Marshmallow". android.com. ^ Sivanandan, Anvinraj. "Android 6.0.1 Marshmallow With New Emoji Available For Nexus 6P, Nexus 5X, Nexus 6, Nexus 5, Nexus 9, Nexus 7 (2013)". International Business Times. IBT Media Inc.
^ Whitwam, Ryan. "Android 7.0 Nougat is rolling out to Nexus devices starting today". Android Police. Illogical Robot LLC. ^ Haselton, Todd. "Android 7.1.1 for Pixel and Nexus out now, adds new features". TechnoBuffalo. TechnoBuffalo LLC. Retrieved June 21, 2017. ^ Li, Abner. "Android 7.1.1 rolling out to Nexus, Pixel devices w/ new Moves and December security patch". 9to5Google. Retrieved June 21, 2017. ^ Amadeo, Ron. "Android 7.1.1 in pictures: Nexus versus Pixel". Ars Technica. Retrieved June 21, 2017. ^ Li, Abner (August 21, 2017). "Google releases Android 8.0 Oreo factory images for Pixel, Nexus as OTA fails for many [Update: Fixed]". 9to5Google. Retrieved August 30, 2017. ^ Hager, Ryne. "Android 8.1 OTA files and factory images are now live". Android Police. Illogical Robot LLC. Retrieved January 13, 2018. ^ "Death of the Nexus: Final guaranteed OTA updates hit Nexus 6P and 5X". 9to5google.com. Retrieved January 24, 2019. ^ Amadeo, Ron. "Nexus 5X and Nexus 6P review: The true flagships of the Android ecosystem". Ars Technica. Retrieved December 22, 2015. ^ Bohn, Dieter. "Nexus 6P review: the best Android phone". The Verge. Retrieved December 22, 2015. ^ "Some Nexus 5X devices have a display malfunction, Google will happily replace it". TalkAndroid. October 21, 2015. ^ "Nexus 5X users reporting issues with touch response during charging". Android Authority. November 20, 2015. ^ "Nexus 5X Users Stuck In Boot Loops After Android 7.0 Update". Ubergizmo. September 21, 2016. Wikimedia Commons has media related to Nexus 5X.